Homemade meat sauce layered with melted cheese and creamy alfredo sauce. For the Bolognese Sauce: In a large pot on medium heat melt butter with oil. Add onion and sauté for 3 minutes until translucent. Add garlic and sauté for 1 minute. Add ground beef and Italian sausage. As it cooks, break into small pieces. Continue cooking until browned. In a small cheesecloth combine basil, oregano, bay leaves, rosemary, sage and pepper. Tie closed with kitchen string. Add to pot along with tomato sauce, tomato paste, water and salt. Bring to a simmer and cook for 3 hours, stirring occasionally. For the Alfredo Sauce: In a small saucepan over medium-low heat melt the butter. Stir in flour and cook for 5 minutes, stirring frequently. Transfer to a bowl and cool to room temperature. Insert the cloves into the onion. In a medium saucepan combine the onion, milk, salt and pepper. Heat on medium heat for 10 minutes. Do not allow mixture to boil. Strain the milk into another clean saucepan, discarding the strained pieces. On medium heat, slowly whisk in the flour mixture. Whisk until mixture starts to thicken, about 5 minutes. Stir in 1 cup parmesan cheese and heat until melted. Set aside. In a large bowl, combine 4 cups of mozzarella, ricotta cheese, eggs, salt and pepper. To assemble the Lasagna: Coat a 13x9-inch baking pan with cooking spray, spread 1 cup of the Bolognese sauce, followed by a single layer of noodles (breaking them if needed to cover the entire pan). Evenly cover the pasta with half of the ricotta and mozzarella mixture, then spread half of the Alfredo sauce, finishing with 2 cups of the Bolognese sauce. Repeat the layers one more time. Add another layer of pasta and top with remaining Bolognese sauce. Cover with parmesan and remaining mozzarella cheese. Coat a sheet of aluminum foil with cooking spray and cover pan tightly. Place pan on a baking sheet, bake for 1 hour. Remove foil and bake for an additional 20 minutes or until cheese is browned. TIP: If Bolognese sauce is too acidic, add a little sugar to balance out the flavor. 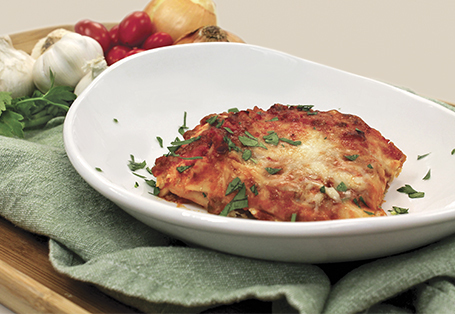 If using traditional lasagna noodles: Cook according to packaging instructions, drain and rinse under cool water.